New analysis from the US has rated our NHS system as the best healthcare system in the world, with the highest levels of quality care and efficiency as well as having low cost at the point of service. Other countries featured in the study include Australia, Canada, France, Germany, the Netherlands, New Zealand, Norway, Sweden and Switzerland. The study incorporates survey results from both patients and doctors on issues such as care experience, medical practices and opinions of healthcare systems. Information about health care outcomes are also mentioned, with details provided by the Commonwealth Fund, World Health Organisation and the Organisation for Economic Cooperation and Development. The NHS was applauded by researchers, the report saying that the UK provides “universal coverage with low out-of-pocket costs while maintaining quick access to specialty services.” Currently state-funded, the findings from this study will be welcome news for those accusing the government of encouraging a privatised NHS system. American healthcare bosses have right to worry however, as the US continues it’s trend of trailing in last place, underperforming in areas such as access, efficiency and equality. 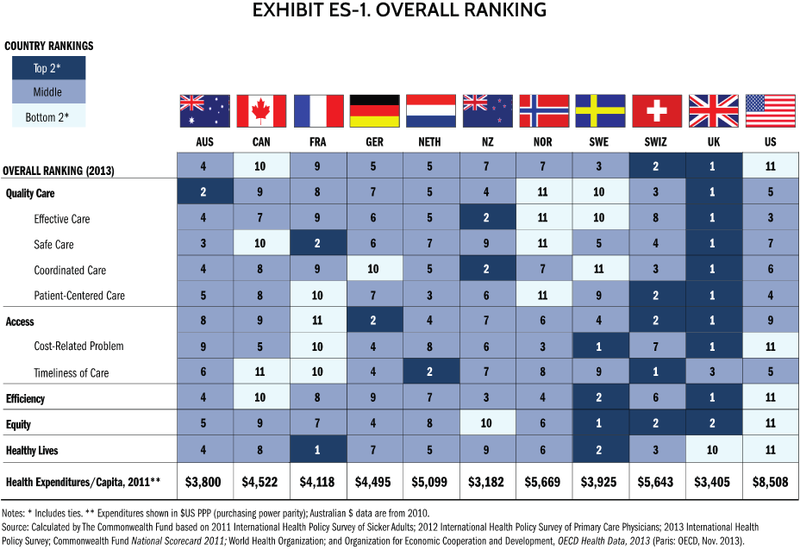 The US is also failing to achieve better patient outcomes when compared to other countries. The analysis revealed that American healthcare costs more than other countries’, yet is less efficient as the US plays catch up in regards to efficiency measures, such as using new technology. So how do America plan to tackle their low rated healthcare? They have recently introduced the Affordable Care Act which aims to help poorer families become financially eligible to obtain healthcare coverage.